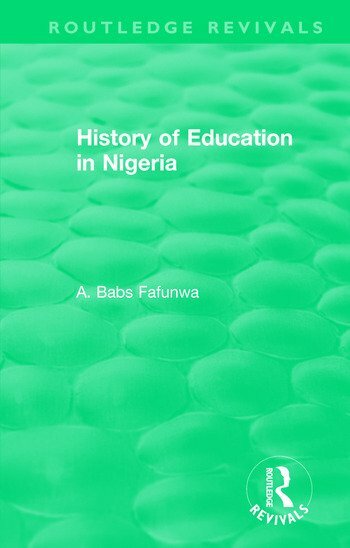 Originally published in 1974, a comprehensive history of Nigerian Education, from early times right through to the time of publication, had long been needed by all concerned with Education in Nigeria, students, teachers and educational administrators. No one was better qualified than Professor Fafunwa to provide such a book, and in doing so he gave due emphasis to the beginnings of Education in its three main stages of indigenous, Muslim and Christian Education. Nigerian Education had been considered all too often as a comparatively recent phenomenon, but this book points out from the start that ‘Education is as old as Man himself in Africa’ and that both Islam and Christianity were comparative newcomers in the field. A historical treatment of these three strands which have combined to make up the modern Educational system was vital to a clear understanding of what was needed for the future, and most of the first half of the book is concerned with these Educational beginnings. The imposing of a foreign colonial system on this framework did not always lead to a happy fusion of the systems, and the successes and the failures are examined in detail. There was no shortage of documentary evidence in the form of reports and statistics during the decades prior to publication, but this evidence was frequently scattered and inaccessible to the student, so that the author’s careful selection of key evidence and reports, often drawn from his own personal experience, will be invaluable for those wishing to trace the development of Education in Nigeria up to the early 1970s. A knowledge of the history and development of the Nigerian Education system, of the numerous and intensely varied personalities and beliefs which have combined and often conflicted to shape it, is indispensable to all students in colleges and universities studying to become teachers. It is this knowledge that Professor Fafunwa set out to provide, drawing on his wide experience as teacher writer and educationalist. Preface. Introduction. 1. Traditional African Education 2. Muslim Education in Nigeria: Past and Present 3. The Coming of the Missionaries 4. The Beginning of Modern Education (1882-1929) 5. Educational Expansion (1930-1950) 6. The Era of Self-Determination in Education (1951-1970) 7. The Nigerian Educational System 8. Contemporary Issues. Appendixes. Bibliography. Index.